So, given that invasive alien species were previously acknowledged as a problem and frameworks to combat them were put in place, it might be surprising that there was no initial, robust response from the international community to the 2016 fall armyworm outbreak in Africa. While the threat of invasive species had always been real, it required an outbreak of this very hungry caterpillar in Africa to translate the theoretical threat into a tangible and significant problem for the international community, governments, and the smallholder farmers directly affected by the pest. Fall armyworm has spread rapidly across Sub-Saharan Africa, and in 2016 scientists at CABI projected that in the absence of any control measures potential annual losses to agriculture could reach $2.5 billion to $6.2 billion. And what makes this projection even more alarming is that Africa already struggles to produce enough food for the population and meet demand for exports without the presence of an invasive species like fall armyworm. Smallholder farmers and communities across the region that rely on agriculture have been hit especially hard, making fall armyworm a serious threat to food security. 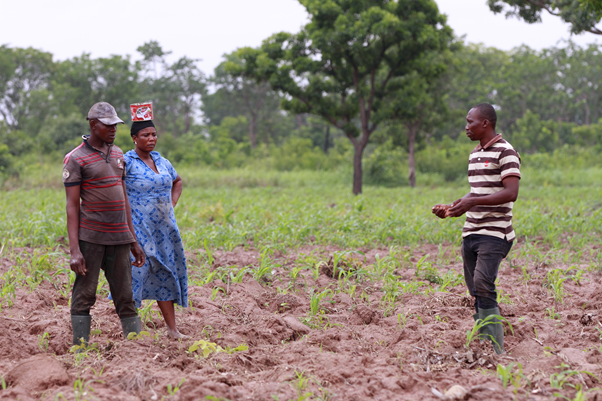 In 2018, Feed the Future and its partners launched the Fall Armyworm Tech Prize to enlist new digital partners with fresh ideas and innovations to find ways to identify, treat, and track the incidence of fall armyworm. Technological advances such as machine learning, social networks, satellite imagery, and others have opened numerous avenues for exploring tech-aided solutions. This prize competition represents just one example of applying technology against the problem of invasive alien species. The global movement for open data means that more information than ever before can be efficiently communicated and made relevant for farmers and others confronting this problem. To halt the march of the fall armyworm, organizations including CABI, Feed the Future, International Maize and Wheat Improvement Center (CIMMYT), Food and Agriculture Organization of the United Nations (FAO), International Centre of Insect Physiology and Ecology (icipe), and International Institute of Tropical Agriculture (IITA) are working together to give farmers the best, immediate advice while also researching longer-term sustainable solutions. The response to fall armyworm could be the entry point to tackle invasive species more widely as it is just one of many invasive alien plant and animal species causing damage across the globe. Although the problem that provoked the formation of the Global Invasive Species Programme 20 years ago is still all too familiar, we are now far better equipped and more prepared than ever to help countries tackle fall armyworm and other invasive species around the world. Roger Day is the program executive for CABI’s new Action on Invasives program. With over 30 years’ experience of working in tropical agriculture in Africa and Asia covering research, development, and capacity building, he has a broad knowledge of agricultural development issues in invasive species, commodity crops, and knowledge for development. His specialist areas of expertise include biological control, phytosanitary systems and standards, integrated pest management, and entomology. Feed the Future is America’s initiative to combat global hunger and poverty, led by USAID, and drawing on the resources and expertise of ten additional Federal Agencies and Departments. The initiative leverages American development leadership to harness private-sector and host-country resources to help some of the world’s poorest countries develop the tools for a secure, stable, and successful future.